The San Benedetto cottage is the old peasant farmer's house attached to the back of a small villa in which the owner (retired Mrs Stevens) lives. It has nice furniture, tiled floors and comprises 2 Double bedrooms, Sitting/Dining room, modern Bathroom, Kitchenette and covered Veranda. Spacious gardens on several levels including many flowering shrubs, mature trees giving shade where necessary and a beautiful swimming pool, which, together with the flat, enjoys marvelous views across to Montepulciano on the next hilltop as well as over Lake Trasimeno and the pre-Apennines beyond. The pool has plenty of chairs and loungers as well as a table and a swing which are spread about so that one can either sunbathe or shelter from the heat. The property extends to 7 acres of woodland and olive trees. Access is by a steep asphalted drive from the main road which runs between Montepulciano and Chianciano. Montepulciano is 5 minutes away by car and 20 minutes on foot. Immediately South of the Villa the Tuscan hills are crowned by almost unpopulated woodland for 40km. A haunt of deer, wild pig and porcupine. A wonderful place to explore on foot or by car on existing tracks. Montepulciano is a beautiful and unspoilt walled hill town in Tuscany. It has good shops, bars and restaurants. One and a half hour south of Florence and 2000 feet up in the Tuscan hills and enjoying fine views to Lake Trasimeno and the pre-Apennines. 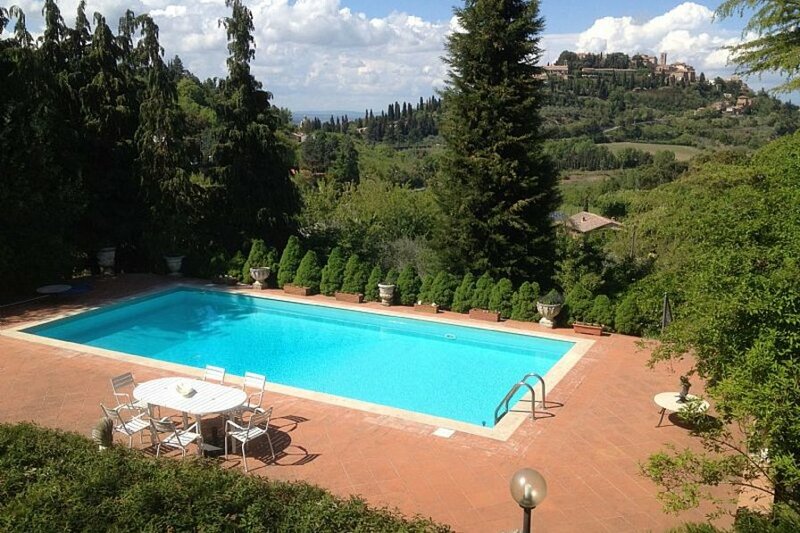 It is about one hour from Siena, Arezzo, Perugia and Orvieto - a perfect centre for exploring Tuscany and Umbria. Places of interest nearby include the beautiful small towns of Pienza (12Km) (Birth place of Pope Pius II with wonderful views across to Mount Amiata); San Quirico d'Orcia (21Km); Radicofani (36Km) (Where the enormous tower of a medieval brigand gives a 360° view); Cetona (18Km); Cortona (28Km); Castiglion del Lago (26Km)(with ferry terminal for the islands on Lake Trasimeno). There are also the small Spas of San Casciano dei Bagni (28Km), Bagno San Filippo (29Km), Bagno Vignoni (25Km) & Rapolano Terme (44km); the last three with thermal swimming pools which use naturally hot water from the ground and are very pleasant during the colder months. Finally Bel Verde, a beautiful small monastery in a sylvan setting (24Km). There are 3 friendly dogs and 2 cats who live on the premises with the owner. They are treated as pets; the dogs are not chained up and do not bark at night. No children under 12 since the pool is not protected by child proof fencing or alarm system. Owner seldom uses the pool, so the pool is exclusive for tenants. Note that the pool is covered and cannot be used over the winter period (early October up to late May). There is a communicating door between the cottage and the main Villa which is kept locked. The owner, Mrs Stevens, speaks perfect English. Check-in time is between 3pm and no later than 8pm. There are facilities for dining by the pool which is about 50 meters away from the cottage across the garden. Pool furniture includes table with 6 chairs, 4 sun-loungers and a swing. In the garden there is also a stone table and benches to seat 4 and a further reading area next to garden fishpond. The veranda also has seating for 4. No barbeque is allowed during the Summer months.